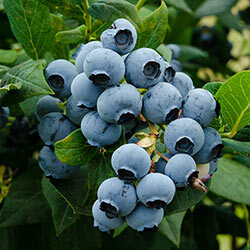 Duke Blueberry - Fruiting Plants | Michigan Bulb Co.
A delectable choice, whether enjoyed fresh or in baked desserts. 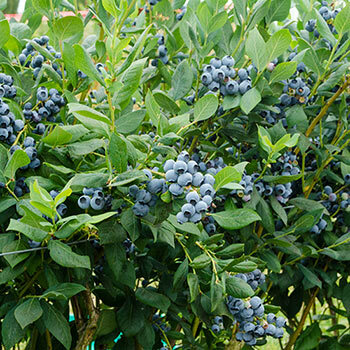 These blueberries have a mildly sweet flavor and stay fresh longer than most other varieties. At maturity, Duke Blueberry will yield up to 20 lbs of huge berries per season! This self-pollinating plant also adds ornamental value to the garden, producing small, lovely, bell-shaped blooms in mid to late spring over deep green foliage. Now shipping, garden ready, in a 1-gallon container. Foliage Type: Dark green, ovate to 3" long. Flower Form: Small, pendulous, bell-shaped. Planting Instructions: Set plant at the same level it is growing at in the container, firm soil and water thoroughly. Mulch to protect the roots and maintain soil moisture. Soil Requirements: Acidic, organically rich, moisture retentive, well-drained soil. Pruning: Remove heavy old stems, weak stems, stems that grow laterally, and broken branches. After the plants begin bearing fruit, cut back all but 6 - 8 vigorous canes. Winter, before new growth starts in spring. Winter Care: Mulch to protect from winter injury.